There is an app in the Android Market called Walk and Text, which allows you to use your camera to see in front of you while texting so that you don’t say, walk right into something. The app runs about $1.54 if you’d like to purchase it, but for the cheap ones in the crowd, I’d suggest that you avoid running out to your favorite shady pirated app site to grab it. Why exactly? Well because someone (possibly, but not likely affiliated) took it upon themselves to set you up in one of the most hilarious fashions I’ve seen in a long time. 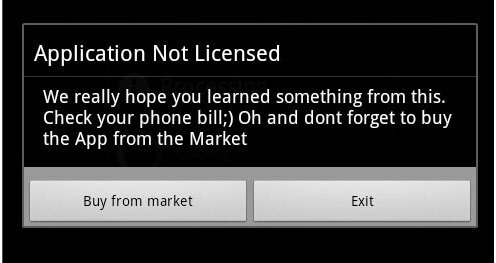 A fake version of Walk and Text has been sent out to a variety of illegal apps sites looking exactly like the original you’ll find in the actual market. That is until you open it of course. Upon launching the app for the first time, it acts a lot like one normally would with a “processing” screen, except that processing screen is just a placeholder while the app accesses your name, phone number, IMEI information, etc. and sends it out to an external server. That’s not all though! Hey,just downloaded a pirated App off the Internet, Walkd and Text for Android. Im stupid and cheap,it costed only 1 buck.Don’t steal like I did! Classic. You should all be sitting at your desks giving the creators of this a round of applause. Piracy is bad, ya’ll. Show a dev some love today.